Holiday menus and buffets are filled with extra rich indulgences, like pastas with Alfredo and cheese sauces. How do you ensure maximum creaminess while trying to address consumers’ desire for healthier-for-you foods? Grande Bravo®functional whey protein in place of cream and/or butter reduces fat and calories, yet maintains the original formulation’s creamy texture – often enhancing it! Grande Bravo is also a natural way to add rich creaminess to dressings for festive holiday salads, like the perennially popular Broccoli Walnut salad or one with a new twist, Spinach Pomegranate salad. Cheese spreads, Reuben and artichoke dips…these traditional favorites can be made just as creamy as when using original recipes, but feature less fat and calories and added protein when Grande Bravo is part of the formulation. 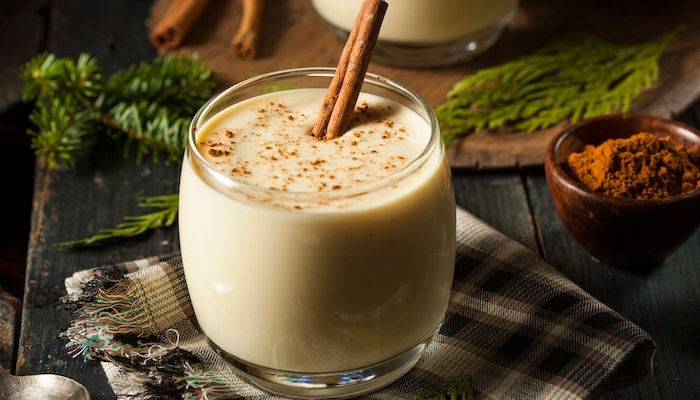 Now consumers can indulge in egg nog without all the guilt! Replacing cream with Grande Bravo will result in a low-fat version of this classic holiday beverage with all the rich creaminess of the original. There’s no reason to ignore the season when talking about sports and nutrition beverages, and when it comes to adding protein to these and other popular drinks, Grande Ultra®WPI boasts the best combination of clarity and flavor available, and its neutral taste lets the natural flavors of even “subtle” fruits come through. High-protein peanut butters made with Grande Ultra can be used in traditional holiday treats like Peanut Butter Balls and Peanut Butter Blossom cookies, making them delicious and more nutritious! Grande WPCrisp whey protein crisps make protein and nutrition bars even more appealing because along with a crispy crunch, they offer protein consumers are looking for! Incorporate holiday flavors into your lineup with ingredients like dried cranberry and pomegranate. Grande WPCrisp also adds a boost of protein to the holiday’s most popular snack mix made with cereal, pretzels and nuts. GrandePrimo™ dried yogurt and cultured dairy products add authentic yogurt flavor to holiday dressings, both sweet and savory. Those hosting holiday get-togethers will be proud to offer guests the unique flavor of yogurt while delivering more in the way of nutrition. Grande Primo also adds authentic yogurt flavor to smoothies. Think of the seasonal possibilities: cranberry, pomegranate, chocolate mint…so many varieties can be made more unique with yogurt’s unique flavor and texture! Holiday snack mixes are even more appealing when ingredients are dipped in coatings made with Grande Primo. The rich creamy mouthfeel and the taste of yogurt combine to make sweet snacks something special. Use Grande Primo in sweet dips that can be served with red and green fruit and graham cracker dippers. What’s on your product development list for 2017? If it’s solving challenges of texture and nutrition, or developing new products that address consumer demands for protein, texture or flavor, reach out to Grande Custom Ingredients Group. Our team of experts has in-depth knowledge of product development and can also leverage the skills of our food scientists to work with you.